Leading Manufacturer of ball valve type quick coupling from Mumbai. We have been ranked as the most dependable and leading firm all over the nation and actively emerged in providing Ball Valve Type Quick Coupling. These couplings are developed in adherence with the industry set norms by utilizing high-quality material & modern techniques. Our couplings are precisely tested on several parameters by quality controllers, in order to ensure delivery of a perfect range. 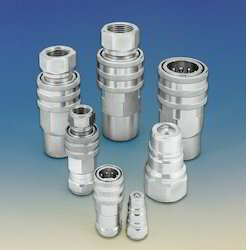 Offered couplings are available from us in diverse specifications to choose from. Looking for DIN Quick Coupling ?